If you thought one WIT was powerful, just wait til’ you see what two can do! Yes, that’s right, there’s another WIT – the Women In Trucking Association, Inc. – on the road and together we’re helping put more girls in the driver’s seat than ever before! 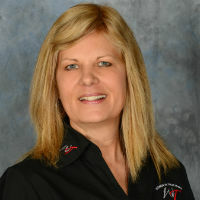 The merging of the WITs was the result of a chance airport encounter between Women in Toys member and HABA USA president Lea Culliton and Ellen Voie, founder and CEO of Women In Trucking. A shared goal of empowering girls opened the (truck) door to a meaningful partnership, the result of which was Clare. 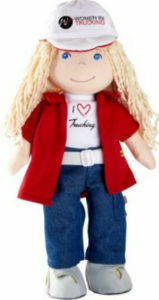 Featuring blue jeans, white belt, “I Heart Trucking” tee, red collar shirt, boots, and a Women In Trucking baseball cap, this adorable plush doll stands 13” and shines with plucky spirit from her freckles to her fingertips. 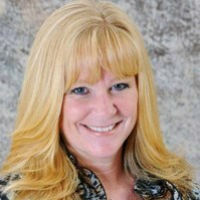 Her package features the story of Clare’s journey into the driver’s seat of her very own 18-wheeler. In addition to inspiring girls everywhere to follow their own, special dreams, Clare will be touring the country this summer, starring in photos shot by professional drivers in various locations on the road. Just goes to show you, there’s no stopping a WIT member with a dream! Clare can be found at travel centers around the U.S and on Amazon.com and HABAusa.com beginning in April.